There is no better example of two worlds violently colliding than a long stretch of highway. Here you will find mankind zooming back and forth and nature attempting to move between high-speed vehicles. For those on the road and those animals about to cross it, a brief encounter and misstep can lead to grave circumstances. 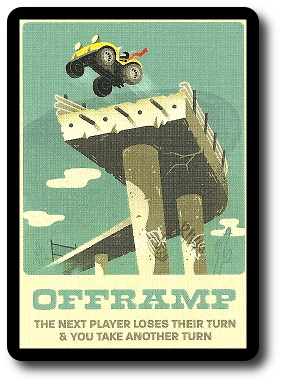 Roadkill Rivals, designed by Matt Graff and to be published by Pygmy Giraffe Games, will reportedly be comprised of 68 cards. As this is a review of a prepublished game, I will not comment on the game component quality. 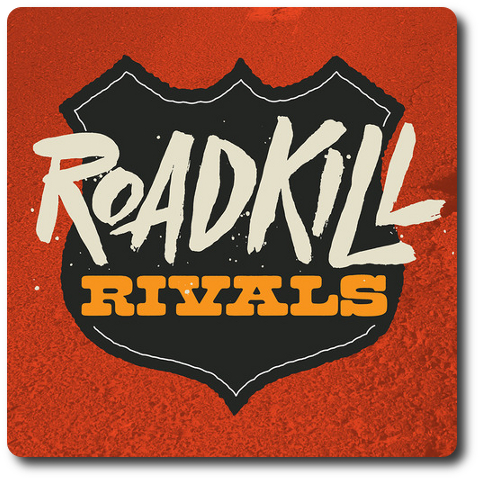 The illustrations for Roadkill Rivals are provided by Jolby & Friends, a design studio that primarily focuses on brands and big companies outside of the gaming world. As a result, each card is highly stylized, looks like something you’d want on a shirt or a beer bottle, and is very pleasing to the eye. To set up the game, first shuffle the cards and place the deck face-down in the middle of the playing area. This is the draw deck for the duration of the game. 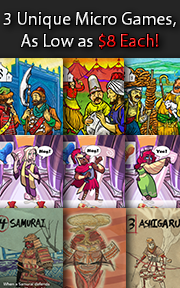 Second, deal the top 4 cards, placing them in a row to one side of the draw deck, face-up. This row of cards is referred to as the “Community” and the cards it contains are referred to as “Community cards”. The space on the other side of the draw deck is reserved for the discard pile. Roadkill Rivals is played in turns with no set number of turns per game. On a player’s turn, they will select 1 out of 4 possible actions. Some cards allow the player to take additional actions on their turn. Each action is summarized here. The player can take 1 Community card and place it in front of them, face-up. Face-up cards in front of the player are referred to as the “player’s hand”. After taking a card, the player draws a new card, adding it to the Community. In this way, there will always be 4 cards in the Community visible to the players. There are three different cards in the game. Each are summarized here. These cards represent the different animals that can be found beside or dead in the road. The number values listed on the cards range from “1” to “5”, which indicates the card’s strength and point value at the end of the game. Each Animal card also has a “Key” symbol. A player’s hand can never have anymore than 3 “Keys”. These cards represent the different vehicles that zoom up and down the highway at ludicrous speeds. The number values listed on the cards range from “2” to “6”. The Vehicle card’s number value indicates its strength, but vehicles provide very little in the way of points. Only 2 of the 5 Vehicle cards will give the player points, and only +1 point at that. Vehicle cards also have a “Key” icon, which will contribute to the player’s hand “Key” limit. These cards allow the player to take different actions. Some Roadside cards must be resolved immediately when taken by the player, while others can be left in the player’s hand and used later in the game. Roadside cards that are kept by the player also have a “Key” icon, contributing to the player’s hand “Key” limit. If a player wants a new card in the Community, but they already have 3 “Keys”, they will need to discard a card currently in their hand so the maximum number of “Keys” with the new card is no more than 3. A Roadkill is comprised of one or more Vehicle cards that have a combined strength equal to or higher than the total strength of one or more Animal cards. For example, 2 smaller Vehicle cards can be combined to take down 1 very strong Animal card. All cards used must come from the player’s hand. If the player is able to complete a Roadkill, all the cards used are taken from the player’s hand and placed face-down next to the player. This is the player’s score pile. All cards in the player’s score pile will be counted for points at the end of the game and are protected from opponents. 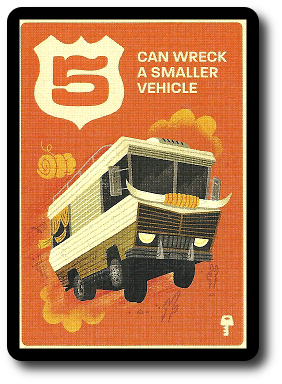 If the player has the strength “5” (RV) or strength “6” (Semi-Truck) Vehicle card, they can target 1 Vehicle card in an opponent’s hand that has a smaller strength value. The opponent must place their targeted Vehicle card in the discard pile, but he player’s Vehicle card remains in their hand. 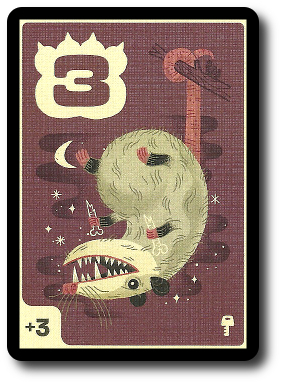 If the player has the strength “4” (Coyote) or strength “5” (Rattlesnake) Animal card, they can target 1 Animal card in an opponent’s hand that has a smaller strength value. The opponent must place their targeted Animal card in the discard pile, but he player’s Animal card remains in their hand. After taking an action, the player’s turn is over unless another card allowed the player to take additional actions. Once all actions and Roadside card effects have been resolved, the player’s turn is over. It’s now the next player’s turn. The game ends when the last card in the draw deck is placed in the Community. All Community cards are taken and placed in the discard pile. Each player takes any cards still in their hand and combines it with their score pile. Each player now counts the points in their score pile. Note that some cards reduce points. The player with the most points wins the game. If there is a tie, the player with the most cards in their score pile wins. To learn more about Roadkill Rivals, visit the game publisher’s website or visit the Kickstarter campaign. For the most part, the Child Geeks enjoyed the game. They quickly learned how to play and jumped right in without issue. They struggled at first with the 3 “Key” limit and a number of the older Child Geeks kept a really big Animal card or Vehicle in their hand to do nothing more than mess with other opponents. This, as it turns out, is actually a very good strategy, since cards in the player’s hand count as points at the end of the game. 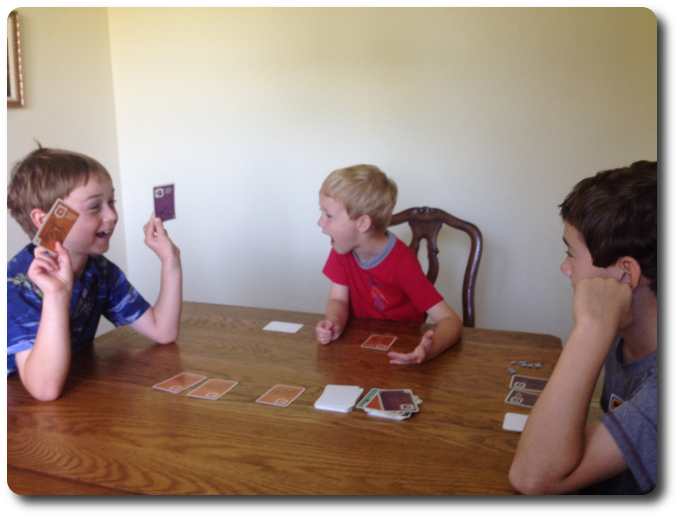 According to one Child Geek, “If you own a big truck or the poisonous snake, you own the game.” Another Child Geek said, “The key to winning the game is keeping everyone else scrambling for small cards so you can pick them off one by one.” Which, of course, generated a lot of anguish. As one Child Geek put it, “I hate this game! I can never score any cards and there are some players who are doing nothing more than just taking cards away!” When it came time to vote, Roadkill Rivals received high marks from those Child Geeks who enjoyed a quick game of “Take That!” and player confrontation. The other half of the group wanted a game they could play and have a chance to win without the aggressive players making it near impossible to do so. They didn’t think that was possible with Roadkill Rivals and voted to reject it. The end result was a mixed level of approval from the Child Geeks. The more casual and non-gamer Parent Geeks greatly enjoyed Roadkill Rivals. According to one highly entertained non-gamer, “This game is a lot of fun. The rules make sense and I like how you have to keep moving cards around to find just the right combo. I don’t like how other people can mess with you, but I love that I can mess with them!” Another Parent Geek, who identified themselves as a “serious” gamer, was not as pleased with the game. According to him, “I don’t like these kinds of games. You spend more time trying to avoid other players and their shenanigans than just focusing on attempting to win the game. The entire game is too much work to be fun.” But another “serious” gamer Parent Geek disagreed saying, “This game is really challenging. It can be immensely frustrating, but also wonderfully rewarding.” In the end, Roadkill Rivals was both enjoyed and disliked by the Parent Geeks, resulting in a mixed level of approval. The Gamer Geeks did not like this game one bit. According to one Gamer Geek, “This game is an absolute waste of my time. All you do it take a card and then cross your fingers that your opponents are either blind or stupid so they don’t mess with you.” Another Gamer Geek said, “The problem with this game is that the game’s designer opened the floodgates when it comes to player interaction. Each player only has 1 turn, but can be attacked by opponents again and again and again. The end result is a game that made me feel like a punching bag.” And finally, another Gamer Geek said, “This game’s only value is that it allows you think of all the other games you’d rather be playing. That and it doesn’t take very long to play.” Not surprisingly, based on the rather spirited commentary, the Gamer Geeks rejected Roadkill Rivals. Roadkill Rivals is a mix of “Take That!” and “Oh, Crap!” Players will have the opportunity to stick it to each of their opponents again and again, causing much confusion and a lot of delay. Players will also be the target of such attacks, again and again, causing them to fuddle with their cards in an attempt to desperately score points. Which is surprisingly hard. Depending on how aggressive the player’s opponents are, scoring points is going to be very difficult, if not impossible. I did not care for this game. Every turn boiled down to selecting a card and then hoping you weren’t the target of an opponent’s attack. In almost all cases, opponents will mess with you unless you have nothing of value. I spent more time trying to keep cards in my hand than attempting to score a Roadkill. Which felt contrary to the game’s goals. My level of exasperation with the game and my opponents was only slightly offset by my ability to put as much pain on them as they were putting on me. I will say this: Roadkill Rivals makes you think really hard about what you can do in a very, very short amount of time. Zoom! Bang! Damn! That’s the game. Roadkill Rivals is all about the short bursts, hard hits, and quick getaways. I cannot recommend Roadkill Rivals to any player who yearns for a game full great depth and strategic game play. Roadkill Rivals is not that kind of game. I do recommend the game to any player who is looking for a quick filler full of dodges, nasty uppercuts, and sucker punches. The game’s title says it all. “Roadkill”, as in you will be run over multiple times and “Rivals”, as in everyone in the game is looking to take advantage of any visible weakness. Victory in this game is measured in inches, despite feeling like you’re being drop kicked for miles. If Roadkill Rivals sounds appealing to you, then I invite you to stomp on the gas and smack it head-on. Tagged Animal Games, Card Games, Prepublished Games, Transportation Games. Bookmark the permalink. That is some seriously sweet-looking artwork. There’s a part of me that thinks it would be great, if nothing else, as coffee table décor. But then I remember that I don’t actually have a coffee table. For reals, though, it’s a shame that your group didn’t care for it. I saw the ads on BoardGameGeek, clicked through to the Kickstarter page, and set a reminder. But after watching the designer’s instructional video, I did kinda look sideways at the sabotage mechanics. While it’s technically a detriment to the saboteur in that he/she doesn’t actually progress, it seems like it would always be in a player’s best interest to sabotage an opponent… and your write-up seems to confirm that that’s usually the case. On the other hand, seems like it would be easy to house-rule, right? Granted, you shouldn’t have to slip into the designer chair–I just mean that the small amount of text on the cards would make it easy to apply altered rules. It seems from the video and your write-up that the biggest potential issue is a player constantly being pummeled away from the scoreboard. I wonder if there’s a way to easily limit the amount of times a player can be attacked or how often a player may initiate an attack. Like, each time you score, you gain some sort of point that can either be used to attack or defend against an attack (but wouldn’t detract from your already-scored points). Perhaps that would encourage players to score more often, and create a bigger risk by delaying a scoring action. Or heck, if even just a smidge or risk were involved… with numbers this small, each player rolling a D4 would shake things up so that it’s not a sure thing. Still, I’m sure you’re right that this would probably kill (pun intended) in the right room of casual players. Even games like We Didn’t Play-test This At All can be a load of fun with the right crowd. Much thanks for taking the time to read the review and leave a comment, Ben. The illustrations to be provided for the game are excellent. You are absolutely correct; they would look great on a coffee table or on your wall. Just the right amount of color, dark lines, and expression to be very pleasing to the eye and the player. The game play, however, was not. Like art, the game did not “click” with everyone. The ability to attack any opponent you wanted and very few options to defend against said attacks made the game feel like an exercise in being punched repeatedly rather than driving like mad down a highway. In truth, players started to feel like the roadkill portrayed in the game, with their opponents as the surrogate vehicles barreling down upon them. You could house rule this game without issue, of course, but the object of the lesson at hand is not to suggest how the game can be improved based on subjective reasoning. Rather, the focus is on the game play out of the box and how others reacted to it. In this case, Roadkill Rivals was a “love it or dear-lord-I-hate-it” kind of game. Not for everyone, but then again, what game is? From my perspective, I’ve done my job. I’ve told you and others what the game is about and how it was received. I hope you get an opportunity to play the game so you can experience it for yourself, Ben. And a wonderful job you’ve done! 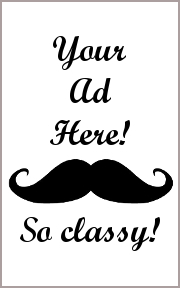 I hope my comments didn’t imply otherwise–not my intention at all! It was a very thorough review and report of your groups’ experiences. Pleasure to read, as always! Hi Ben and Cyrus, thank you for taking your time to review the game and provide a dialogue. I am the game designer and manager of our kickstarter campaign. The attack mechanic of the game is something I’ve been fiddling with for months, back and forth. Changing it to be stronger, so that you’d want to attack, but then it got to be too powerful. Changing it to be weaker, but then nobody attacked, making it useless. Or creating cards to counteract and defend against a strong attack move. I thought I had it in a good place when we sent out review decks last month based on our testing in May and June. But based on some recent blind playtesting at our local game store and a recent review or two (like this one here at fathergeek), I am aware that the experienced gamer can exploit the attack move. That’s okay to hear. I can take criticism without getting feelings hurt, and I want the game to be great. Ben, I am blind playtesting a rules adjustment that I think will balance the gameplay, and will announce it as our kickstarter campaign progresses. I’m setting up playtesting now. It doesn’t effect any of the artwork, or amount of cards. It’s a simple change we can make in the rulebook and with the text on the cards. I’m so grateful for experienced reviewers like fathergeek and local playtesters for catching it. My mistake for not catching it a month ago. I can admit that. BUT, I will not put out a game that isn’t the best that I can make it. And we still have two months or so until the files get sent out to be printed. I hope this instills some faith in the gameplay. And supports the great artwork and unique theme.